Last month, WholeTrees paid a visit to Seattle, Washington. Alongside attractions such as Pike Place Market and the Space Needle, the Emerald City is also known for its leadership in sustainable construction and for housing the International Living Future Institute, which runs the world’s most ambitious green building standard. In addition to attending the 2017 Living Future unConference, we had the opportunity to meet with regional design leaders such as Mithun and Graham Baba Architects, known for high-performance projects that draw inspiration from Washington’s abundance of both natural beauty and natural resources. Street view of Weyerhaeuser headquarters in Seattle. Such an abundance of environmentally thoughtful design practices in Seattle is no coincidence. The region’s history of sustainable resource use is reflected in its architectural language. Weyerhaeuser, one of the world’s largest owners and managers of private forests, is the sixth most valuable company based in Washington. Located in Seattle’s vibrant Pioneer Square neighborhood, their “tree fort” office by Mithun is an homage to reclaimed wood and mass timber sourced from the company’s forests. The prevalence of timber in Seattle building design effectively uses local resources and expertise from Cascadia’s extensive network of woodlands to create buildings designed to encourage end-users’ physical and mental wellness. 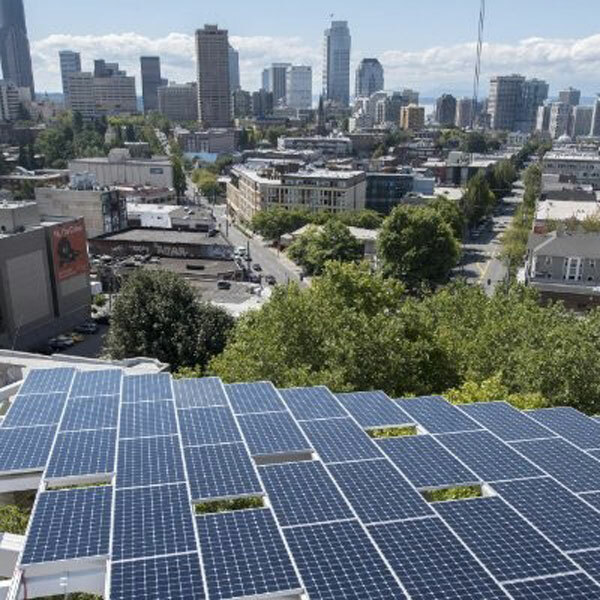 Seattle and the rest of Washington State are in a unique position to leverage their renewable natural resources to meet increasing challenges from climate change, urbanization, and the need for woodland management by building with mass timber. Seattle’s building code has also been pioneering healthy building advocacy and setting the bar for green building evaluation and certification since the late 1990s. In 2009, Seattle became the first city in the United States to pass legislation providing incentives for buildings pursuing certification through the Living Building Challenge (LBC) standard. This Living Building Pilot Program (LBPP) offers departures from standard city land use code for qualifying new and retrofitted buildings, in the interest of more easily reaching sustainability metrics through the design and construction process. In 2016, the LBPP was officially signed by the City to continue until 2025. Interior of the Bullitt Center, showcasing its steel and mass timber structure. These developments have generated a progressive and exciting climate for sustainable building projects. In 2013, the Bullitt Center - commonly hailed as “the world’s greenest commercial building” - opened its doors in Seattle’s Central District. Although not the city’s first Living Building (that honor belongs to Bertschi Elementary School’s Living Science Building) the 50,000-square-foot, six-story Bullitt Center is the first heavy timber mid-rise building to adorn Seattle’s cityscape in over 80 years. The Center’s net-zero energy, water, and waste reduction systems, all housed within a structural system fabricated from FSC-certified timber, are a testament to the viability and reproducibility of large-scale sustainable building projects with many more to hopefully follow. Other municipalities such as Cincinnati and Miami Beach have recently implemented LBPPs modeled on Seattle’s, with the Cincinnati Zoo housing the world’s first LBC-certified zoo exhibit. Main hallway of the Sustainable Living Building at Maharishi University of Management. The intersection of energy and material standards makes the LBC a rigorous performance standard to meet. Building with local and/or reclaimed timber earns credits for the LBC’s Materials petal, which holds building materials to strict standards for sourcing and embodied energy. WholeTrees Structural Products are an example of a timber building product that assists in fulfilling the LBC’s material imperatives. WholeTrees timbers are also Declare certified, meaning they are free of prohibited “Red List” substances.. Maharishi University of Management’s Sustainable Living Building, an LBC-compliant project in Fairfield, Iowa, showcases the possibilities of modern and sustainable building by utilizing a structural skeleton of WholeTrees timbers, alongside other restorative features such as greywater recycling and off-grid wind and solar energy systems. By going above and beyond current green building standards, Seattle architecture stands at the forefront of the “deep green” design and construction movement and sets an example for other cities looking to transition towards healthier built spaces. The geographic diversity of Living Future unConference attendees and the dozens of project teams pursuing the LBC show the extent of this sustainability standard’s influence in building markets across North America and the rest of the world. By showing that commercial buildings can be simultaneously sustainable, functional, and beautiful, Seattle’s building scene displays leadership and initiative in this field. WholeTrees hopes to make many more trips to this inspiring energetic region in the future.